Argentine Oso is a big boy born at 32# he was off at the start. He has soft fiber and a gentle spirit. 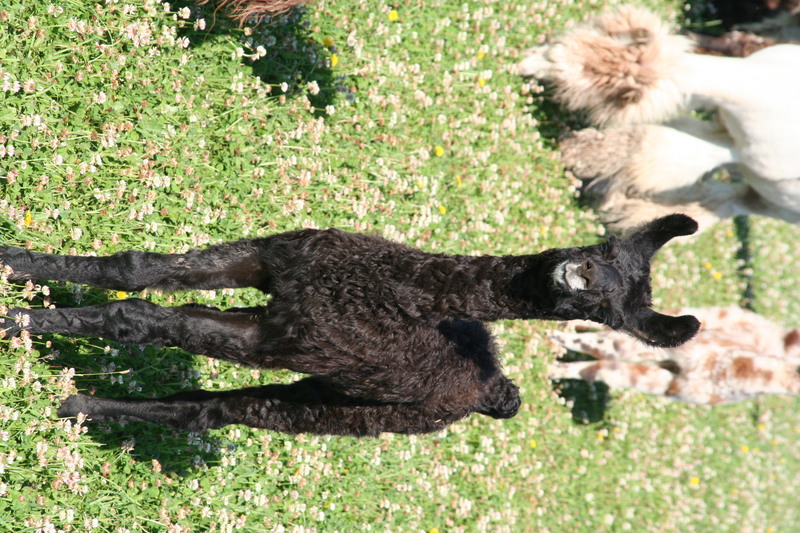 His mother Argentine Zeva is a first time mother and his father Argentine Frappuccino has few babes on the ground. Frappuccino has glorious fiber and was Grand Reserve in fiber a few years ago. Argentine Ali is a fighter like Muhammad Ali. Born in June his mother initially struggled with milk so he was bottle fed for a week off and on. He is now a strong young male and very gentle. His flowing fiber is from his grandfather Argentine Poltergeist. He will be a stunner. He has Argentine Don Zunca but in the fourth generation. Argentine Thor was a mystery baby. Born to Argentine Sombra, a second generation Argentine llama in the United States, who is 19 years old but still a great mother. We had decided not to breed her any longer, but she had other ideas. His father is Argentine Blanco Chico and this is his first offspring. He has very wavy hair like his father and going to be a good herd sire.